Daybreak Morning Blend gets you up and out on the right side of the bed. Costa Rican, Guatemalan, Colombian, and just a hint of Ethiopian beans are roasted to chocolate brown for this light re-energizer. Unassuming and cheering, this coffee starts sweetly and quietly in the mouth and leaves you with fruity, nutty hints after each sip. It's the perfect K-Cup pack for slow mornings or those days you have to rush to work! 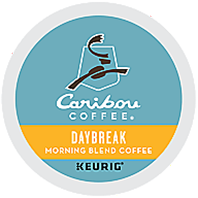 Daybreak is a Rainforest Alliance Certified coffee.